Integrate your computer telephone system with your Microsoft Dynamics® NAV database with this fully integrated solution. Using screen call pop to alert you to an incoming call, linking to all possible contacts. From the Call Card connect directly to Contact, Customer and Vendor cards. Does the solution have a call pop feature? Dynamics Telephone Integration is a system for Computer Telephony Integration (CTi), allowing you to integrate your phone system with Microsoft Dynamics NAV, allowing users to quickly and directly retrieve information on contacts. When a telephone call is received, the Add-on produces a pop-up list of all contacts associated with that specific number. Once the user has clicked on the name of the specific contact making the call, the Add-on quickly presents important information relevant to that contact. Will we be able to quickly access data in NAV? Rapid response time and access to relevant contact information are both essential when dealing with incoming telephone enquiries. It is crucial that telephone operatives can access specific information regarding customers and contacts in a quick and efficient manner, without wasting time searching and filtering through an extensive contact database. Providing direct, seamless access to contact information ensures enquiries are dealt with more effectively, and allows employees to deliver a more personal, attentive service which is tailored to each distinct customer. Can we access various different types of information in the call? 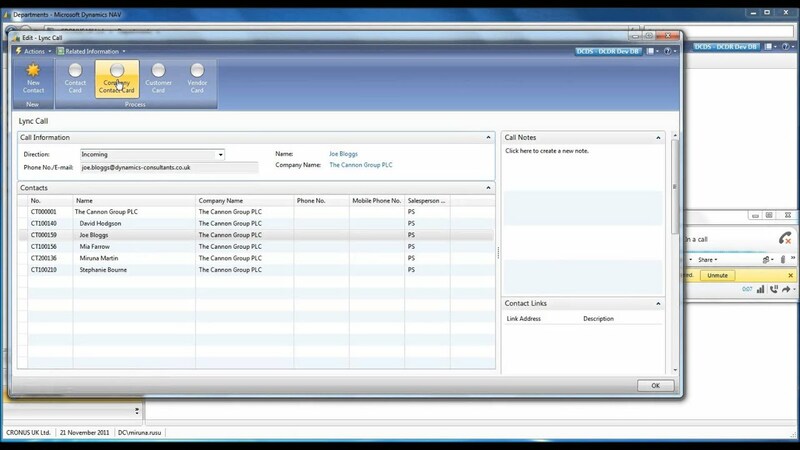 Dynamics Telephone Integration allows the user to open customer / vendor cards, contact cards, related contact cards, orders, and also gives you the option to create a new order for the specific contact directly within Dynamics NAV. Are we able to log calls? Using NAV interactions, calls can be automatically logged for incoming and outgoing calls against a contact for the salesperson. Watch the demonstration video to learn how Dynamics Telephone Integration will support your telephone operatives and save your business valuable time. As well as supporting Microsoft Lync/Skype for Business, we support a wide range of telephone systems to integrate with Dynamics NAV. If you have a telephone system that is not shown on the list, please do not hesitate to contact us to discuss this. Please note that many telephone system providers require an integration licence, which will be available from your telephony provider and will not be included in our quotations.